that’s green about Digital FX. In fact, we’re striving to be Louisiana’s first green post-production studio. 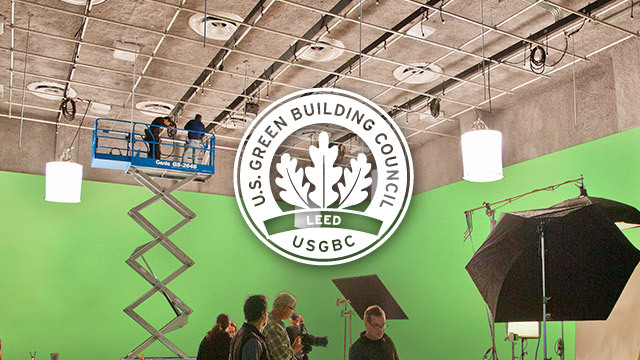 Our new facility is being built to be certified with the United States Green Building Council as a LEED (Leadership in Energy and Environmental Design) Gold compliant facility. At Digital FX, we believe in cleaner, smarter and more efficient use of space and energy. Our new facility will double our current size, but reduce our impact. Using everything from green generators, recycled materials and even a bioswale around the property, we’re creating a responsible and environmentally conscious place to create stunning video and film projects. Transitioned to using green LitePower generators. Goal of reducing waste by using a minimum of 10% recycled materials in the office. Replaced office light bulbs to low impact LED bulbs. Project includes bicycle racks with access to a changing room with shower. Preferred parking will be granted to those with fuel-efficient vehicles. Native plants will be planted to restore natural habitat. Use of high-reflective concrete and roofing products results in reflection, rather than absorption, of sun’s ray. A bioswale will navigate the property allowing for water runoff to be filtered and cleaned naturally before being retained in an on-site pond relieving the strain on public sewage systems. Building will be equipped with a tankless water heater. More than 75% of construction waste will be recycled. We’re using regional materials throughout the property and the use of low-emitting materials throughout construction.